85 of Newport, Kentucky passed away Thursday, April 11, 2019. She was a member of the New Hope Christian Church for over 30 years. Orpha enjoyed working at the church especially in the food pantry. She was an excellent cook and enjoyed working in her flower and vegetable garden. Orpha was born to the late Alvin and Verona Dixon. She is survived by her children Darinda (John dec’d) Wallace and Raymond Troy (Charity) George; grandchildren Amanda (Kurt) Wilkening, Iris (Chad) Wallace, Katie Wallace, April (Josh) Parker, Austin George, Savannah George and Elizabeth George; great grandchildren Richard Michael Parker, Jack Edward Parker, Landan Troy Parker, Naaman Wallace, Eliza Wallace, Adelyn Delany, Dustin Delany, Samantha Delany, Evan Delany, Shane Delany and Zander Delany; siblings Charlotte (Elmer dec’d) Thacker, Robert (Connie) Dixon, Harry (Nelda dec’d) Dixon and Earl (Pansy) Dixon. Along with her parents Orpha is preceded in death by her husband Randolph George; daughter Melinda George; siblings Donald Dixon, Mary (Frank) Hiltibrand and Willa Mae Dixon. 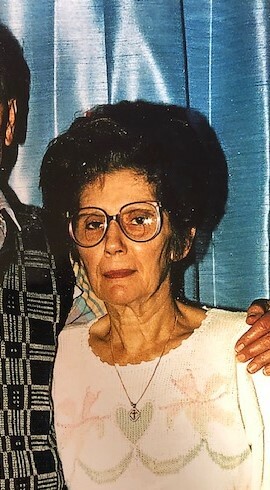 A Visitation will be held at Floral Hills Funeral Home on Sunday, April 14, 2019 from 1pm until time of Funeral Service at 3pm. Burial will be in Floral Hills Memorial Gardens on Monday, April 15, 2019 at 10am. Memorials suggested to New Hope Christian Church, 941 Central Avenue, Newport, KY 41071. Please visit www.floralhillsmemorialgardens.com to leave online condolences.